Testing conditions - but our golfers endured, rekindled friendships and played some pretty good golf all in all. 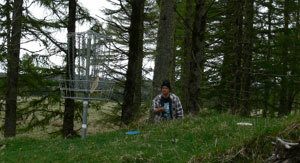 Another successful Smokin' Mountain Disc Golf Tournament. Recovery Plus - Baz Keene (Auckland) has been one of the regulars of this year's Tour. Part in support of his upcoming nephew and speedster David Keene and part simply his 'keene'ness for playing this great sport in multiple scenic New Zealand locations. Nice Putt! 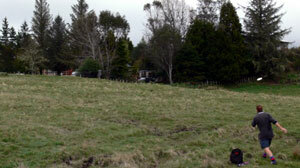 - Cherie Blackburn (Taumarunui) slings one into the chains in true style. Signs of the determination that comes from a few practice rounds on the Discovery course. Mind you, the less said about that Tuesday round 2 weeks ago in the wind the better! Downhill Putt - In a moment of good weather, Simon Feasey (Auckland) makes it all look easy as he heads to his third tournament win in a row and 4 for the year for a perfect NZ Tour winning 200 points. Awesome!. Homeward Bound - The exposure on the tough 9th coming back to Discovery Lodge can make getting a three very hard. 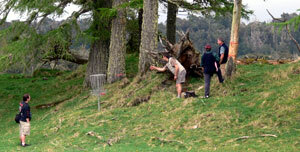 Here Baz Keene (Auckland) attempts to gauge the southerly with a hyzer second to the green. 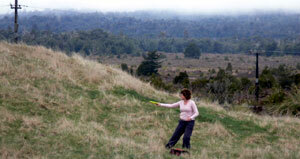 Pretty in Pink - Our Disc Diva of the 2006 New Zealand Disc Golf Tour has to be Ming Menzies (Tauranga), who's game continues to improve every time we see her on the course. 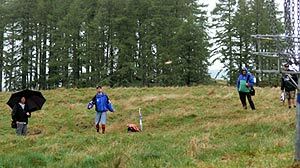 Having competed in four events this year, Ming is the worthy New Zealand Womens Disc Golf Champion. Fly My Pretty - As the course scoots around Discovery Lodge towards its conclusion, Cherie Blackburn (Taumarunui) lets fly a steady straight drive in front of a supporting gallery on the open but tricky 15th. Where's Marty? 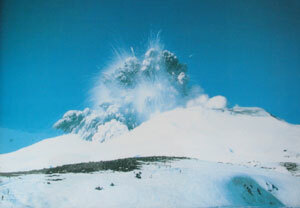 - Local legend Dave Routley (Taumarunui) wondered where his buddy from the Big Smoke was this weekend. Disillusioned with the no show of equally crazy golfer Marty de Haas, Routley was nowhere to be seen on the Sunday. That's Rubbish! 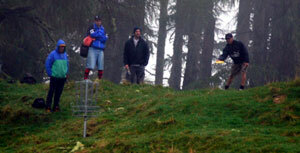 - As the weather turned uglier than the Freaky Styley crew, golfers like Pete Boyle (Taumarunui) donned the wet weather gear for that 'added protection'. Here on the 1st, Pete follows through on his wicked forehand like Keith Moon on a 15 minute drum solo. Top Group - This shot has been enhanced to protect the innocent. No, really, it was so misty as the top group headed out for the final round that players had to sometimes rattle the chains to get a bearing. Here Dean Marshall (Tauranga) has a tricky downhill putt on the 5th on his way to a well played 2nd, gaining him second place overall for 2006. Podium Finish - No way was Dave Keene (Auckland) going to wear long pants - he wanted to make sure those ghastly footie socks were in sight for his top group rivals. Firing a rugged 56 on the final round saw the young fella secure outright 3rd place for the tournament and leap up 3 places in the NZ Tour to finish 5th. Much is promised for 2007 from this lad - but we still have the Match Play Champs to come, where he looks to be up against the Grand Master himself, Bob Gentil. Now that will be good! I Said The Fairway, not the Highway! 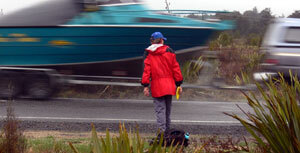 - Vehicles fly by at 100kph as Siep van Vliet (Waiheke) looks for a chance to get his recovery shot in on the 17th. Good consistent golf saw the man who has been throwing southpaw due to an injury gain a very handsome 5th place. What adaptability! What A Putt! - Straight in the chains from over 20 metres, Paul Cohen (Waiheke) shows those basket savvy Waiheke skills with the putter on the 18th. His fellow competitors are ecstatic.